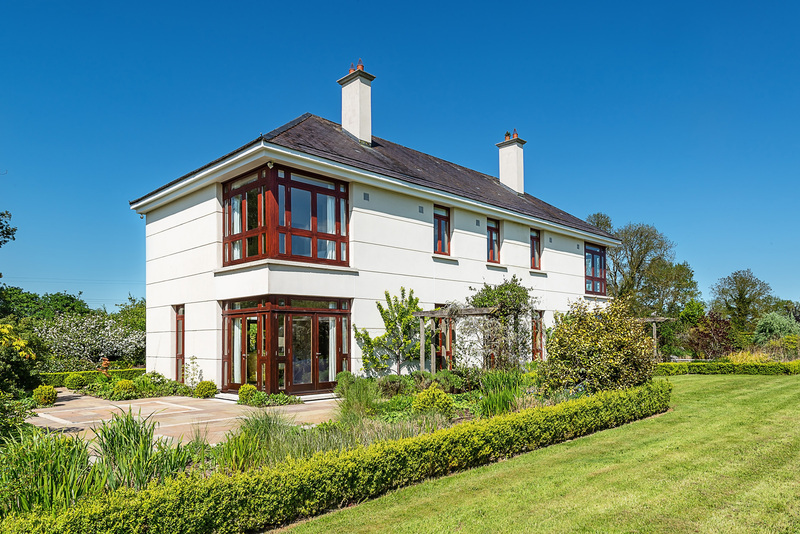 Location: Saurian Lodge, Sherlockstown, Sallins, Co. Kildare, Ireland. 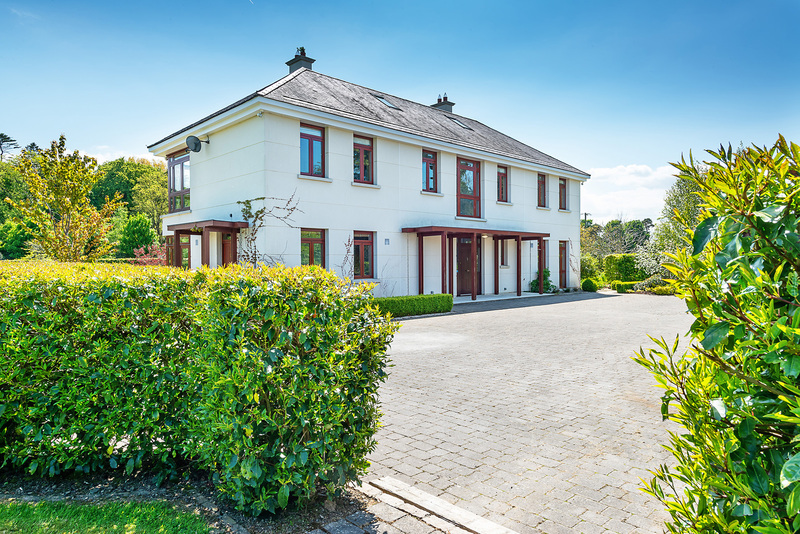 Saurian Lodge, Sherlockstown, Sallins, Co. Kildare. 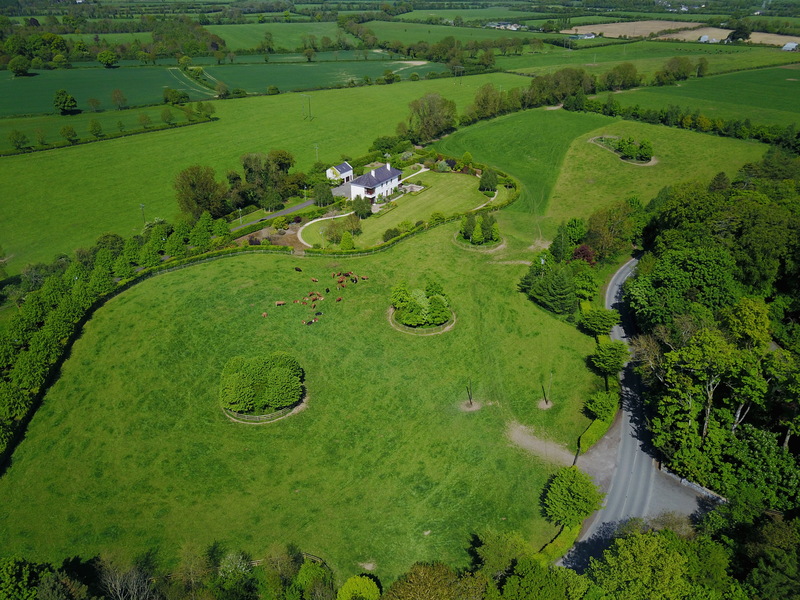 Saurian Lodge is superbly located in Sherlockstown, Sallins which is in the heart of County Kildare, home to Ireland\'s equestrian sector. 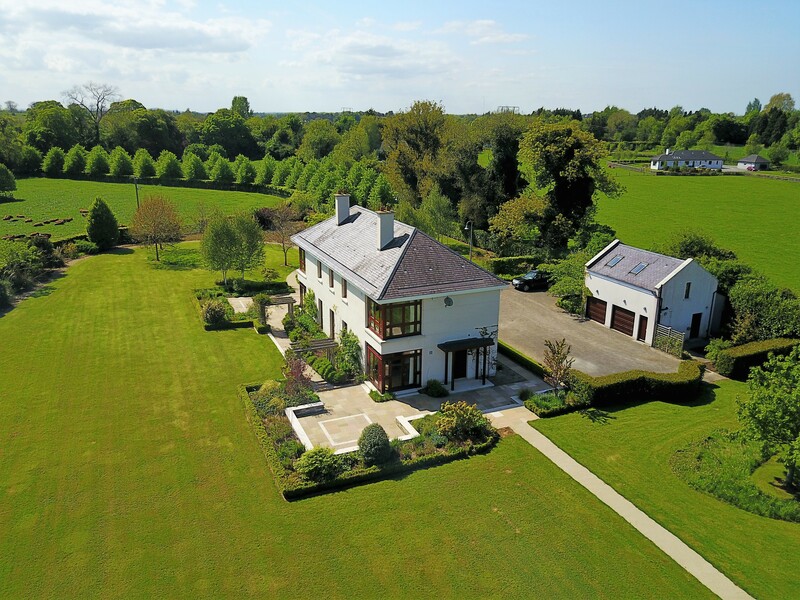 This enviable location affords Saurian Lodge a wonderful country setting on approximately 14 acres yet the convenience of being within 5 minutes drive for both Sallins and Straffan Villages, within 10 minutes of Clane and Naas and within 30 minutes of Dublin City Centre. 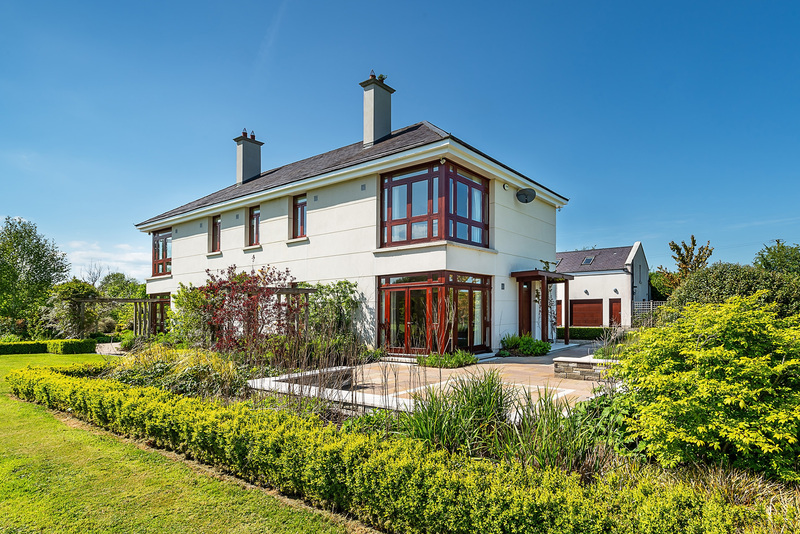 The immediate area boasts numerous Golf Clubs including the K Club (home of the 2006 Ryder Cup), Killeen, Naas, Millicent, Castlewarden and Palmerstown Golf Clubs, all within 10 minutes drive of Saurian Lodge. 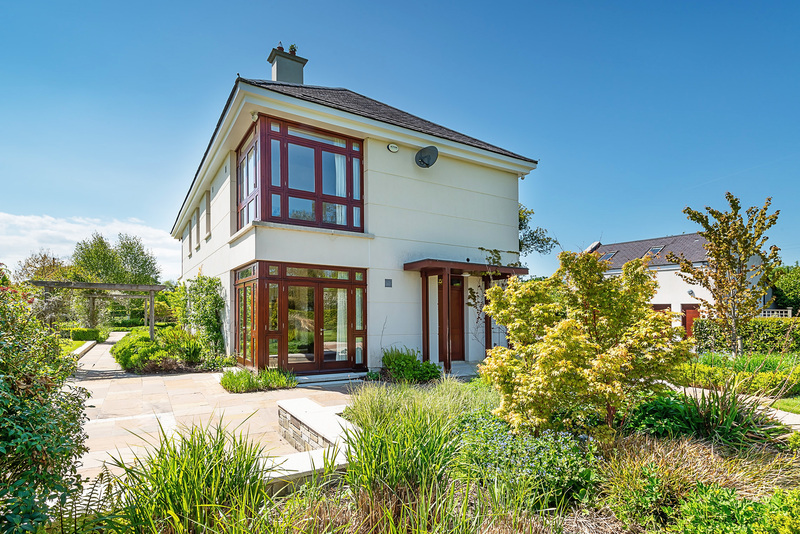 A host of amenities including pubs, restaurants and shops are close at hand at both Sallins and Straffan and further enhanced by the proximity of Avoca at Rathcoole and Kildare Village retail outlet all within a short drive of Sherlockstown. 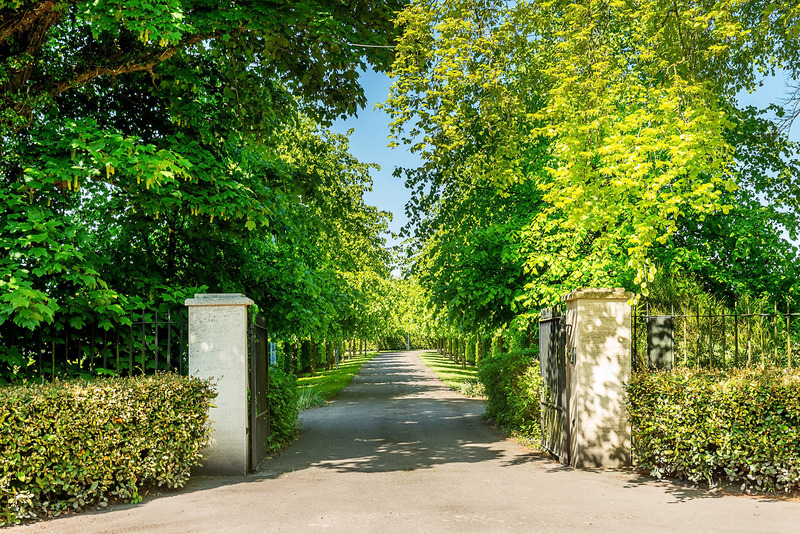 Dublin City Centre: 37km, Dublin Airport: 45km, Sallins Village: 5km, K Club / Straffan: 7km, Kildare Village: 27km. 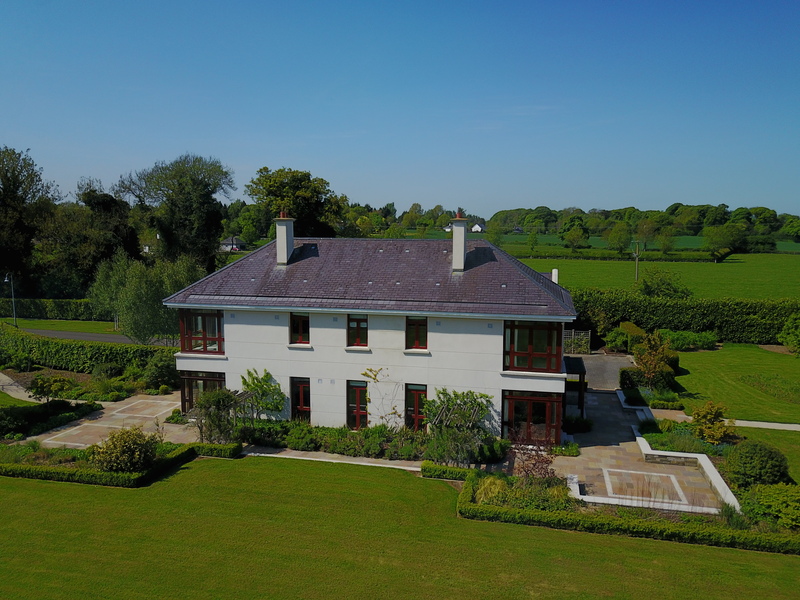 Saurian Lodge is an impressive 5 bedroomed country residence set on generous grounds of c.13.8 acres with landscaped gardens and mature paddocks with post and rail fences. 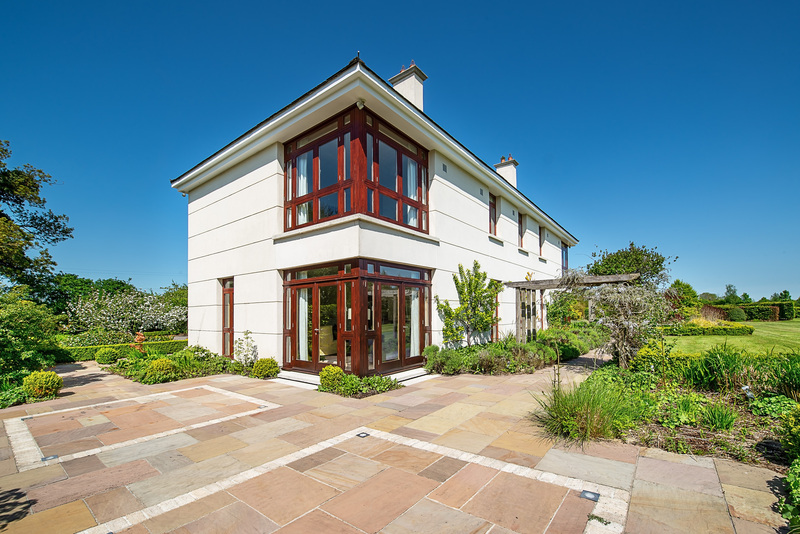 This architecturally designed house is approached by an elegant sweeping tree lined driveway leading to a large cobblelocked forecourt with a detached double garage and parking for numerous cars. 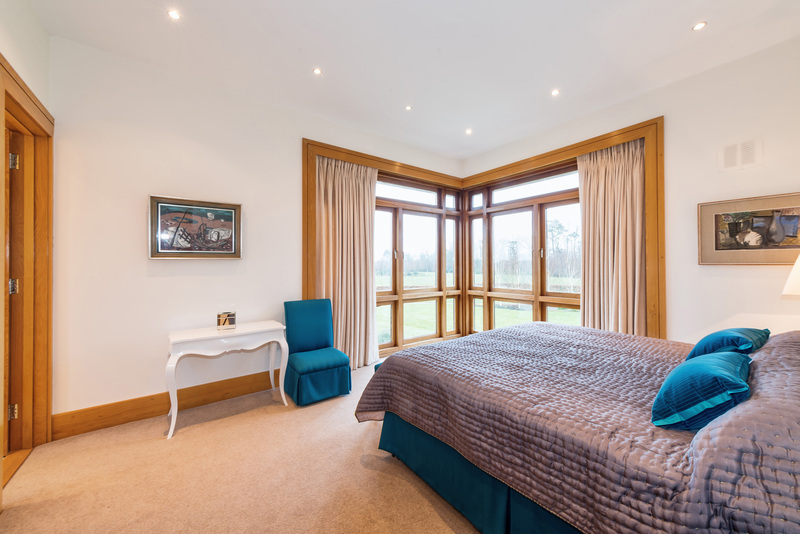 Saurian Lodge was built in 2000 and designed to reflect the classical proportions of a period residence whilst incorporating all the convenience and amenities of a modern family home. 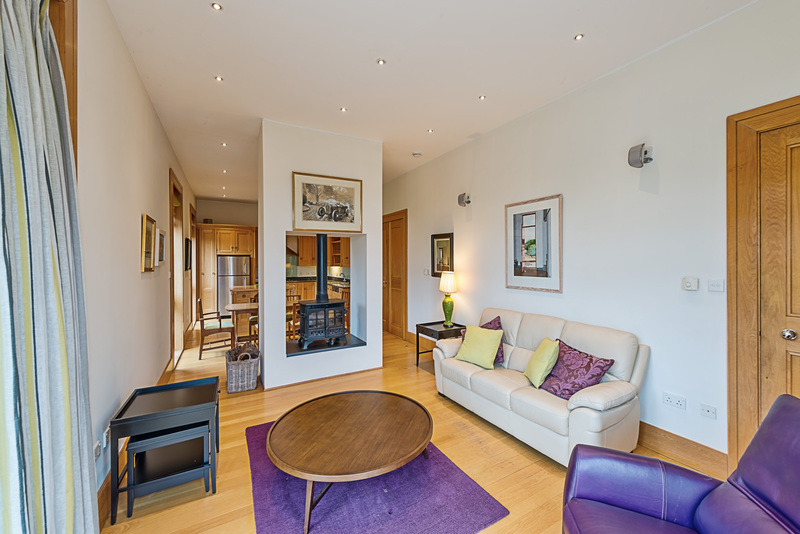 The bright spacious accommodation extends to c.311.2 sq.m. (c.3,350 sq.ft.) 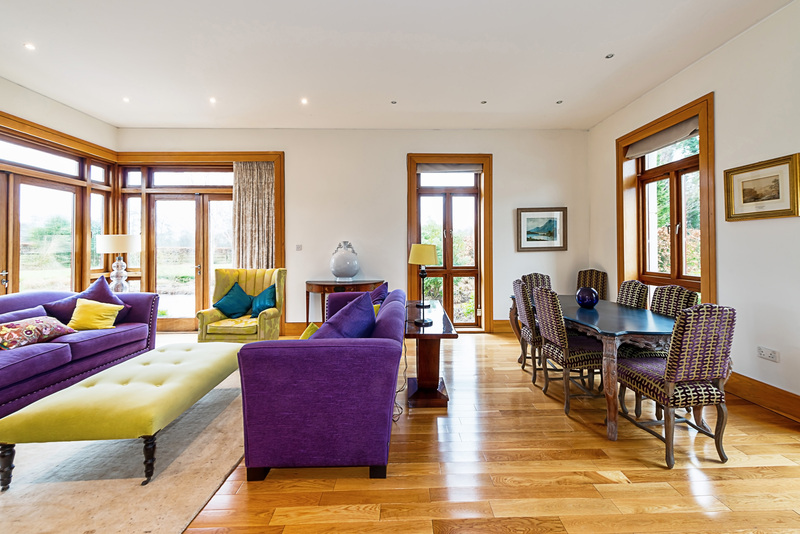 and benefits from extra height ceilings, large solid wood doors, feature picture windows and hardwood polished floors. 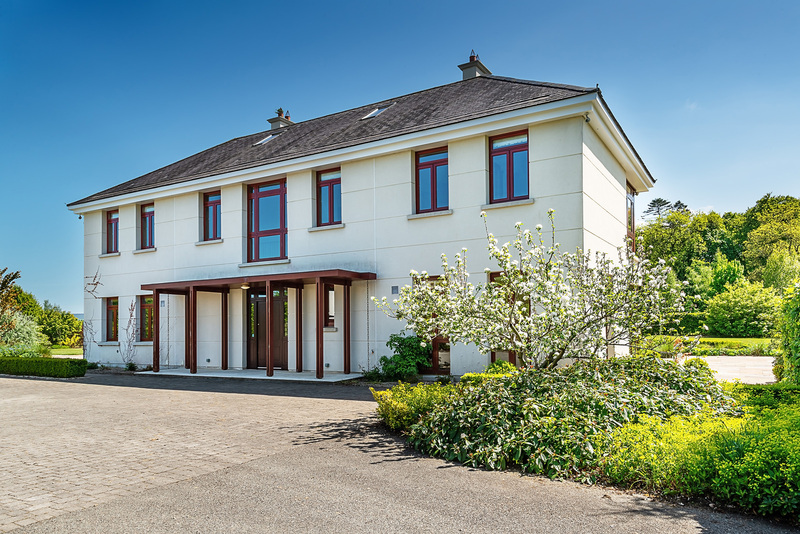 This wonderful family residence briefly comprises a light filled double height reception hall with gallery landing, drawing room, open plan kitchen / dining & living room, study, downstairs cloakroom with wc and large boot room and utility room. Upstairs there are five bedrooms and a family bathroom. 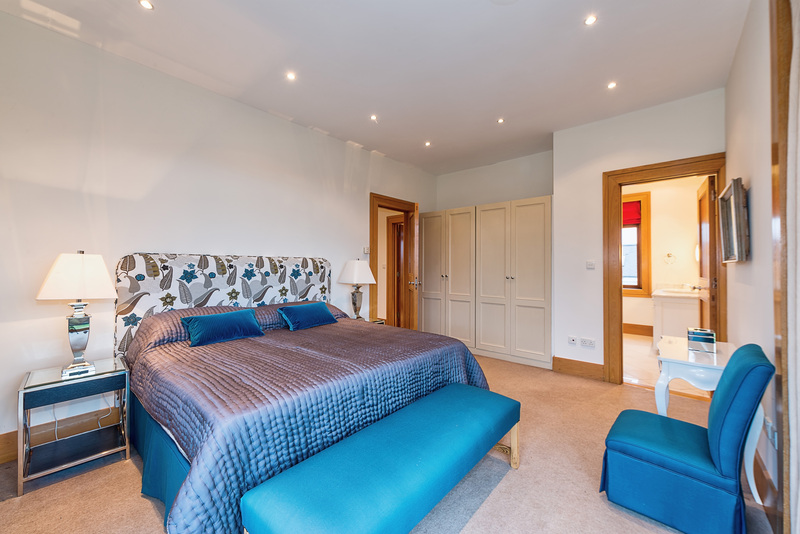 The main bedroom has \'his & hers\' ensuite bathrooms as well as a \'walk through\' dressing room. 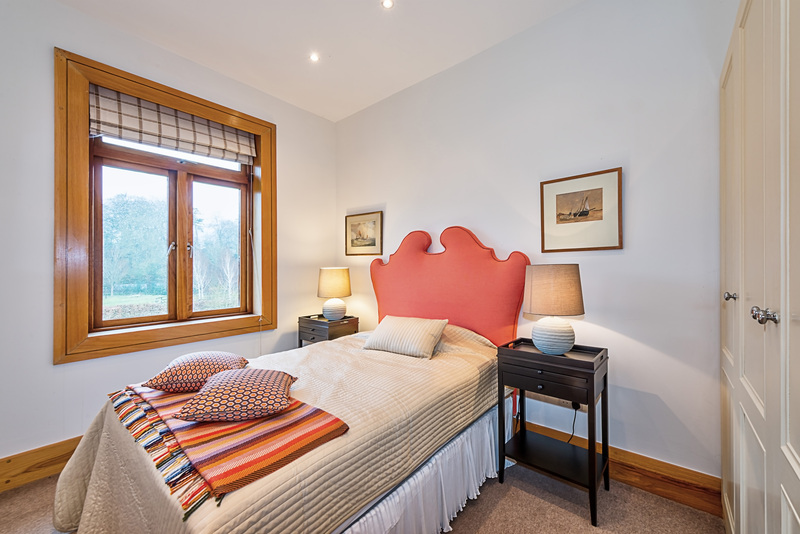 The spare bedroom also has an ensuite bathroom. From Dublin take the N7 Limerick Road turn off at Junction 7 to Straffan, follow Straffan Road for c.2km and turn left onto Painestown. Follow this road for c.4.5km passing Killeen Golf Course and passing over three humpbacked bridges onto Sherlockstown and Saurian Lodge is located on the right hand side just before the junction with Sherlockstown Road. 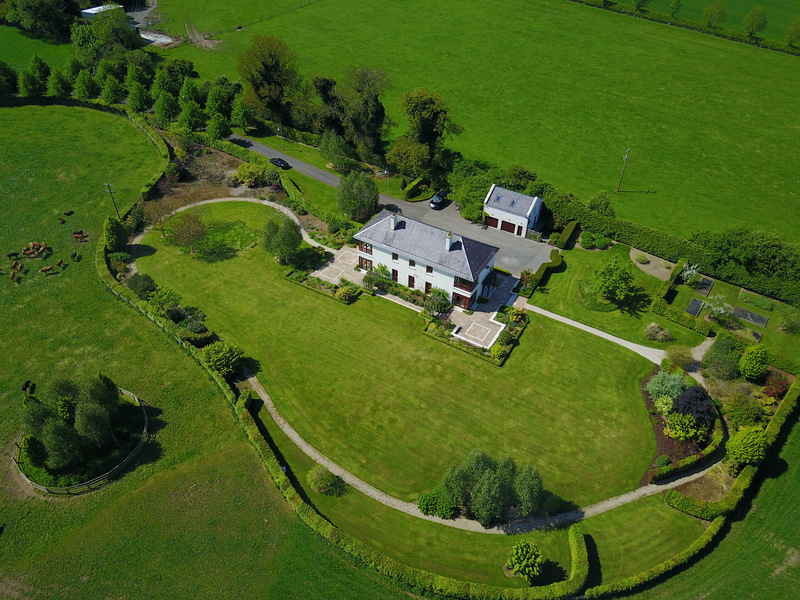 From Sallins follow the Canal View / Sallins Wood Road par-allel to the Canal onto Sherlockstown Road and after approx-imately 3km turn right at the crossroads (towards Killeen Golf Club) and Saurian Lodge is c.100m on the left hand side. 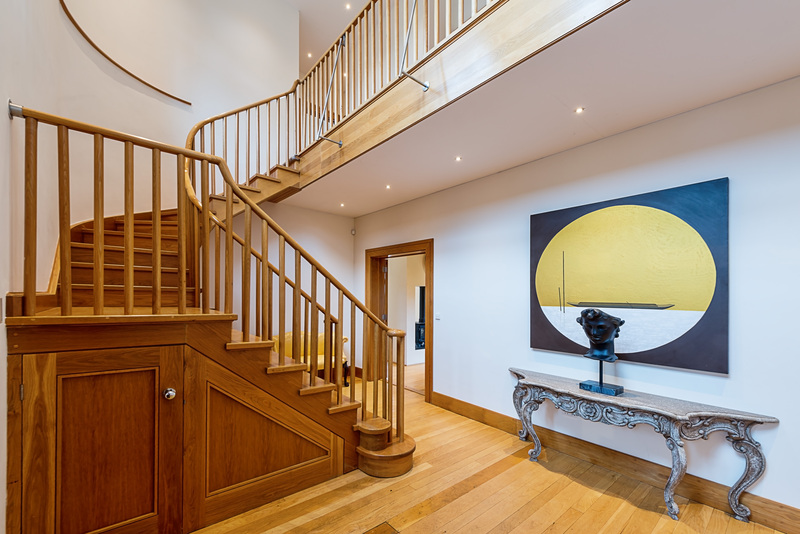 Majestic double height entrance hall with sweeping wooden staircase to gallery landing, recess lighting, extensive under stairs storage and alarm panel. 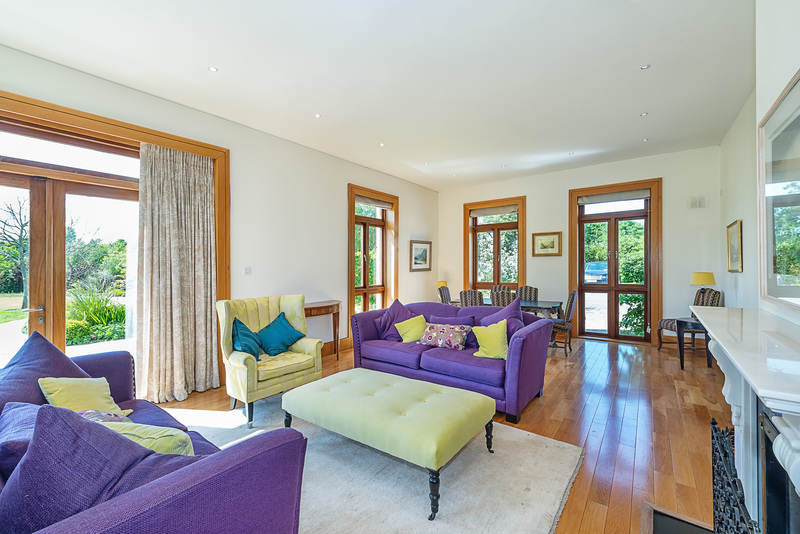 Wonderful bright tri-aspect reception room with feature white marble fireplace with built in oak cabinets, polished hardwood floor with dual French doors opening onto a feature patio and gardens. Incorporates formal dining area. 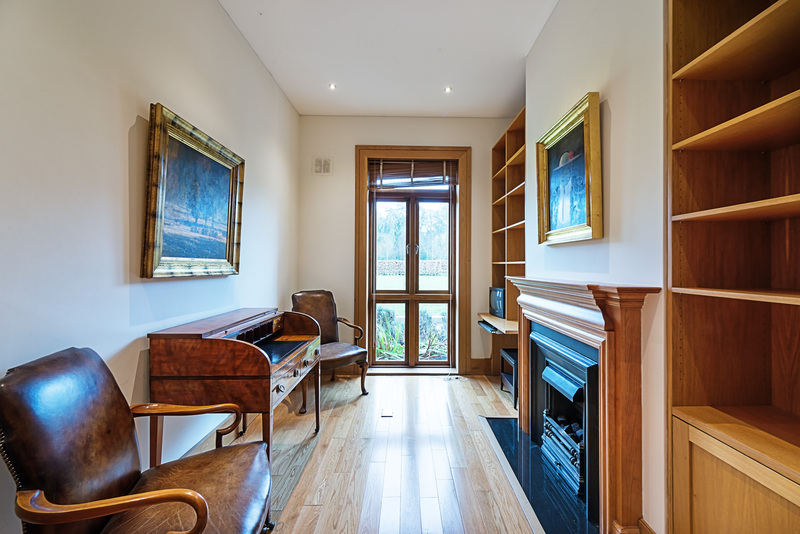 Coal effect gas fire with wooden mantelpiece, fitted bookshelves with cabinets and computer desk, polished wooden floor with recessed power points. Cloak rail and overhead shelving. 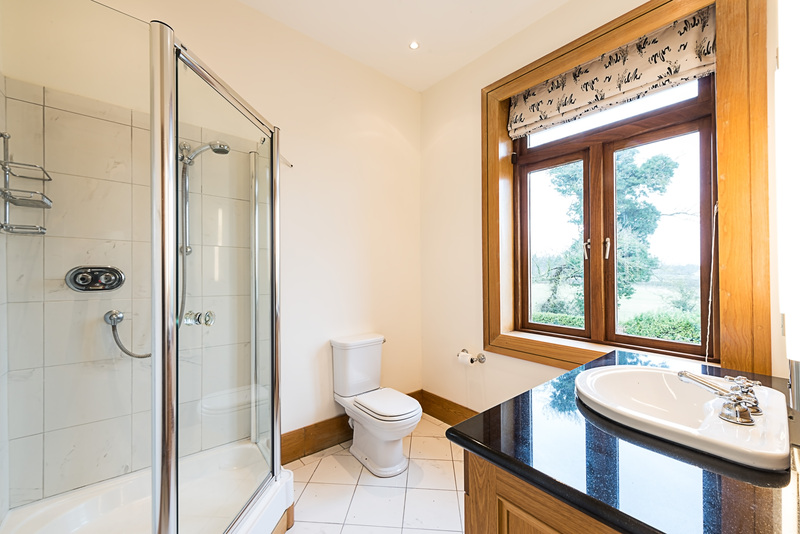 Guest wc and whb with vanity unit with black granite counter. 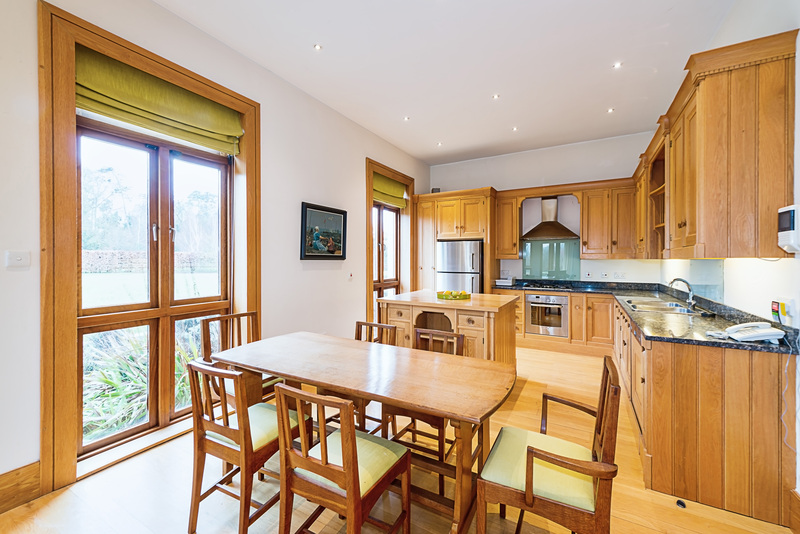 Solid oak fitted kitchen by Mark Wilkinson Joinery with marble worktop, twin stainless steel sinks, integrated dishwasher, Bosch electric oven and stainless steel DeDietrich dual electric and gas cooker with stainless steel extractor fan. Oversized stainless steel fridge freezer and free standing island with wooden countertop and incorporating Bosch Gourmet microwave & oven grill. 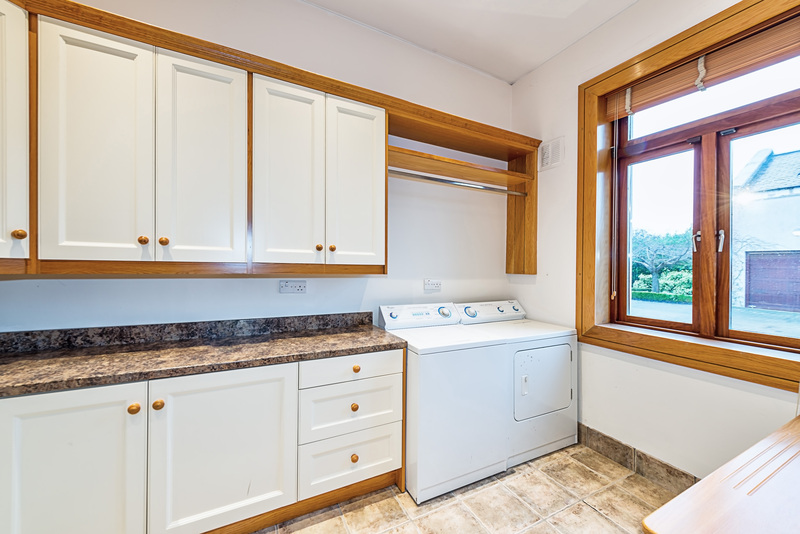 Fitted floor and wall units with stainless steel sink unit Liebherr Fridge Freezer, American Style Whirlpool super capacity washer & dryer. Fitted desk with drawers and a tiled floor. 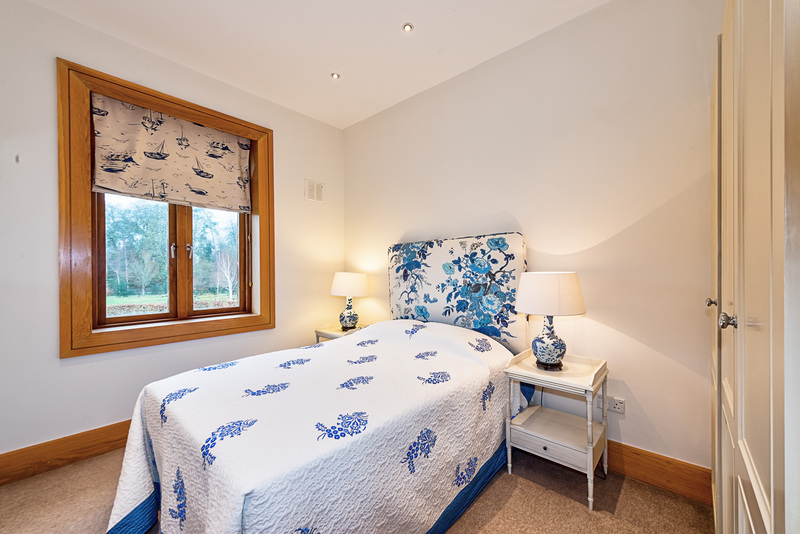 feature picture windows overlooking rear garden. His & Her ensuites, intercom. marble tiled floor, Hansgrohe corner shower, wc, whb with vantity unit and black granite countertop and mirror doored vanity cupboard. 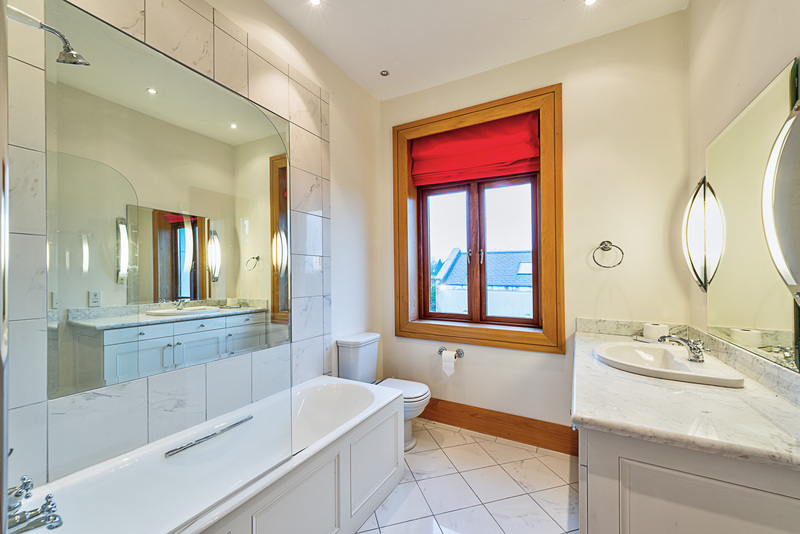 Marble tiled floor, corner jacuzzi bath with mirror surround, wc & whb with vanity with marble counter and mirror fronted vanity cupboard. 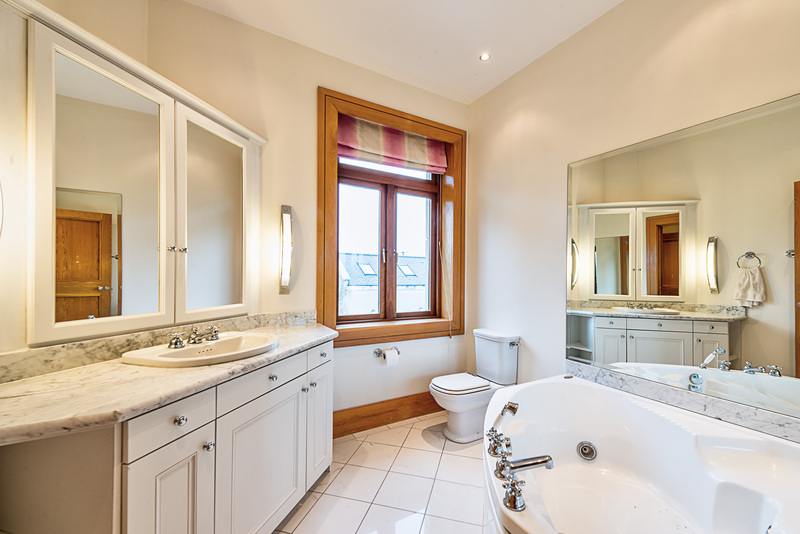 marble tiled floor, bath with tiled and mirrored surround, wc and whb with vanity unit and marble countertop. 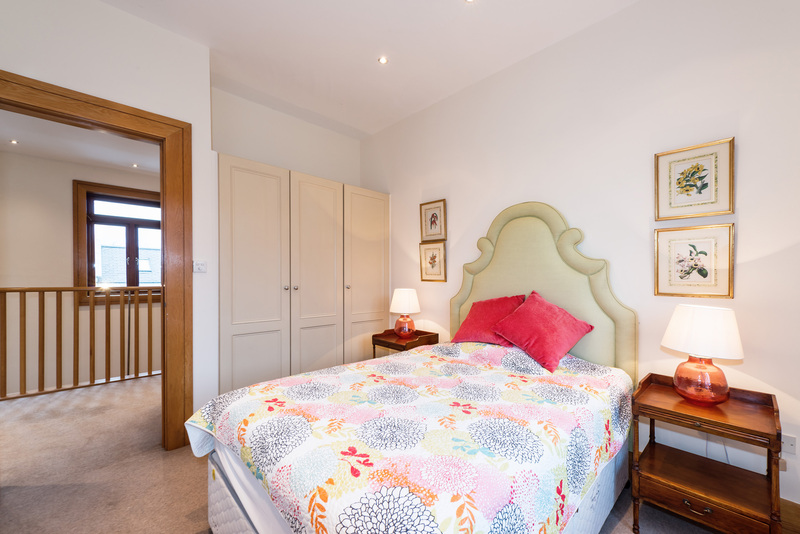 fitted wardrobes and overlooking the back garden. 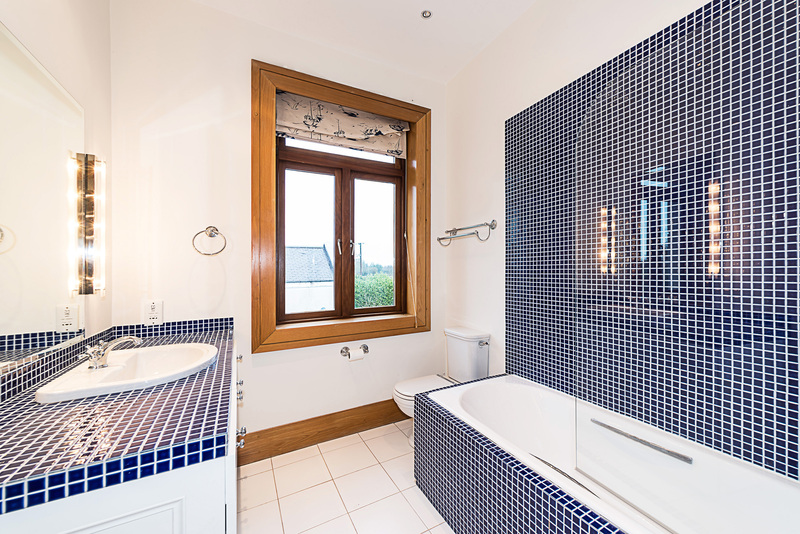 tiled floor, bath with tiled surround, wc and whb with vanity unit. 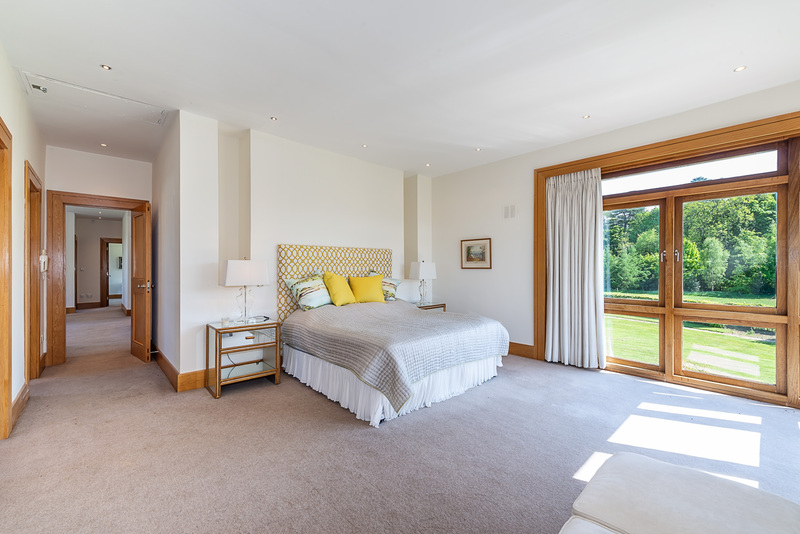 Attic area: There is a floored attic storage area with two velux roof lights accessed via a hatch with retractable ladder in the main bedroom. 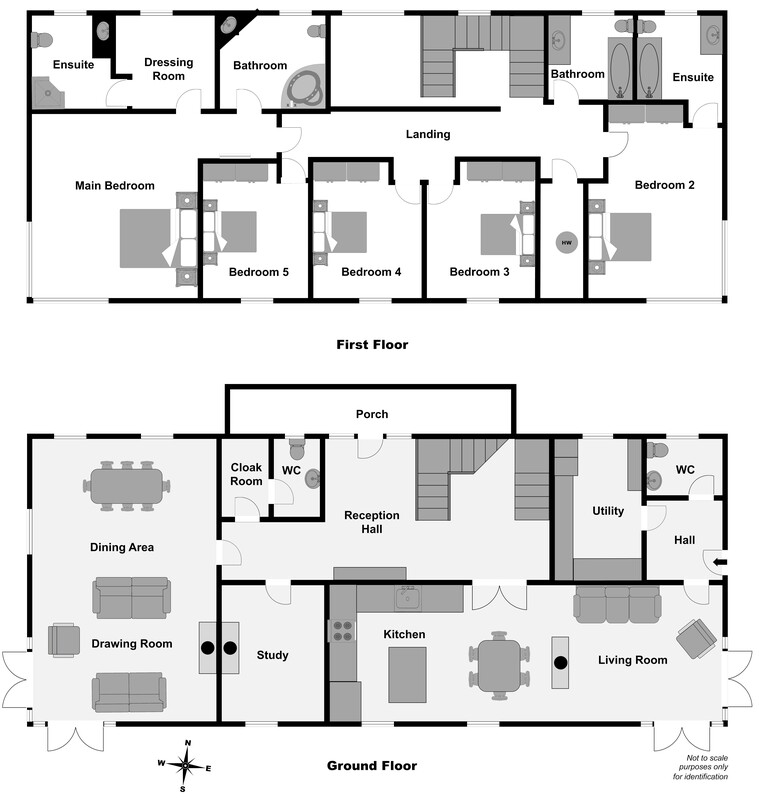 Overall Floor Area: c. 311.2 sq.m. c. 3,350 sq.ft. with overhead loft (c.5.74m x c.6.34m) with staff wc and whb. 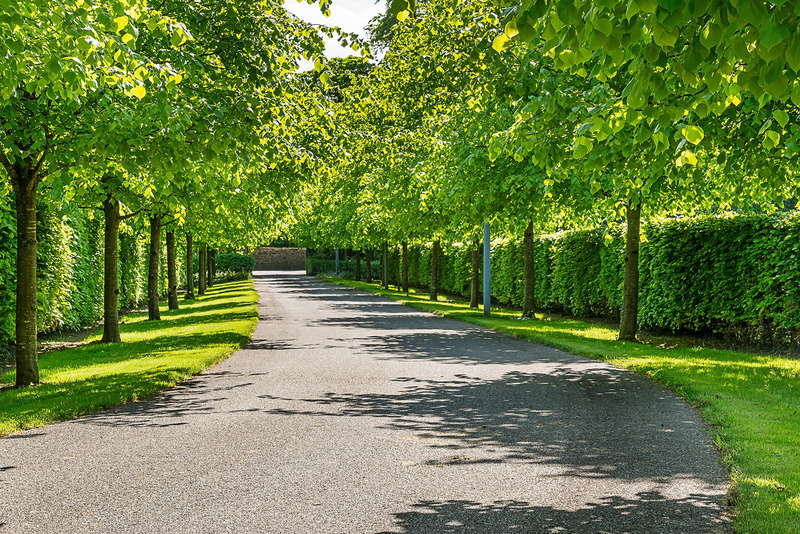 Potential: There is a derelict cottage situated close to the road in the paddock to the left hand side of the driveway which offers development potential (subject to Planning).